Situated in an ecological sanctuary of 70 hectares, Echologia is just 450 metres from Louverné Train Station. The property offers unique accommodation in a pristine, natural setting with fields, forests and 6 ponds. The teepees, yurts and wooden cabins at Echologia have a private dry toilet. Shared bathroom facilities are available in the main building. Free Wi-Fi access is available in public areas. A continental breakfast featuring organic products is offered every morning. The on-site restaurant serves traditional dishes made with fresh, local produce. You can dine on the restaurant?s terrace or enjoy take away meals in your accommodation. On-site activities include swimming, hiking and archery with a certified instructor. Laval is 7 km from Echologia and Laval golf course is 3.4 km away. Tree climbing activities at Le Bois Parcours Nature Accrobranche are 12.7 km away. Please contact the property in advance if you wish to reserve bed linen. Contact details can be found on the booking confirmation. This tent offers a wood burning stove. Dry toilets are located outside the room and walk-in showers are provided in the shared bathroom. This cabin is accessible by boat or canoe. It is powered by solar electricity and has a dry toilet. Please note that this floating cabin is not suitable for children under 10 years old. For safety reasons, it is strongly advised that guests staying in this accommodation can swim. 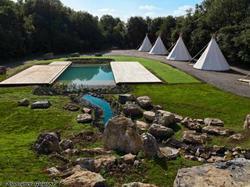 The teepees are located beside 1 of the ponds. Shared bathroom facilities are available in the main building, 200 metres away. This yurt has a traditional Mongolian design with authentic furniture. Shared bathroom facilities are available in the main building. A wood burning stove is provided.